Bluffton’s Deandre Nassar, right, competes against Troy Christian’s Craig Montgomery during Saturday’s Lima Central Catholic Thunderbird Invitational. Allen East’s Garrett Neth, top, competes against Liberty Salem’s Major Stratton during Saturday’s Lima Central Catholic Thunderbird Invitational. Ottawa-Glandorf’s Danny Rosales, left, competes against Carey’s Tanner May during Saturday’s Lima Central Catholic Thunderbird Invitational. 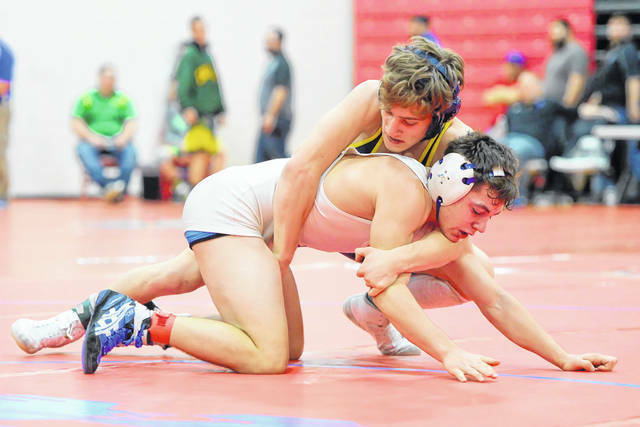 Ottawa-Glandorf’s Isaac Hernandez, top, competes against Lima Central Catholic’s Chase Caprella during Saturday’s Lima Central Catholic Thunderbird Invitational. Lima Central Catholic’s Joey Caprella, top, competes against Troy Christian’s Ryan Whitten during Saturday’s Lima Central Catholic Thunderbird Invitational. Columbus Grove’s Jeff Meyer, right, competes against Nelsonville-York’s Donovan McCollister during Saturday’s Lima Central Catholic Thunderbird Invitational. Team scores: 1. Troy Christian 193.5, 2. Covington 179.5, 3. Eastwood 155, 4. Miami East 151.5, 5. Blanchester 129, 6. Ashland Crestview 110, 7. Allen East 108.5, 8. Bluffton 92.5, 9. St. John 92, 10. Swanton 90, 11. Coldwater 77, 12. Ottawa-Glandorf 74, 13. Newark Catholic and Patrick Henry 73 each, 15. Wayne Trace 72, 16. Lima Central Catholic 67.5, 17. Nelsonville-York 65, 18. Carey 62, 19. Delphos St. John’s 59, 20. Columbus Grove 58, 21. Ayersville 53.5, 22. West Liberty-Salem 50.5, 23. Cory-Rawson 50, 24. Tri-County North 44, 25. Greeneview, Northridge, Woodmore 43 each, 28. Lakota 42, 29. Dixie 40, 30. New London 37, 31. Carlisle 36, 32. Spencerville 34, 33. Madeira 32, 34. St. Josesph C.C. 30, 35. Triad 25, 36. Preble Shawnee 24, 37. Pandora-Gilboa 14, 38. Hicksville 13, 39. McComb 10, 40. Calvert 8, 41. Hillsdale 6.5 42. Mariemont 3, 43. Lincolnview 1. Third time isn’t always a charm, unless you’re on the winning side of it. 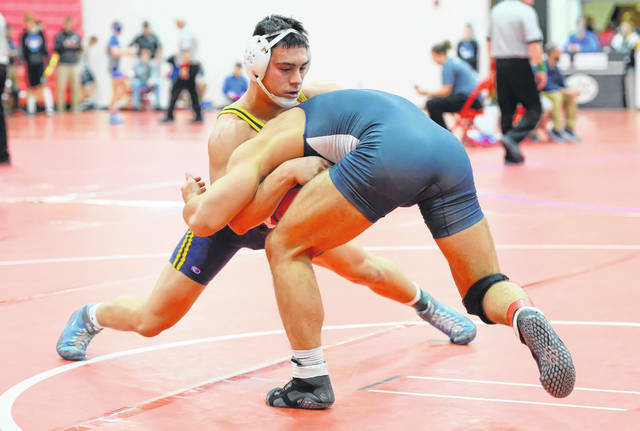 Before this weekend’s Thunderbird Invitational at Lima Central Catholic, Ottawa-Glandorf senior Danny Rosales and Bluffton senior Deandre Nassar had met twice this season on the wrestling mat. Both times, Nassar came away with hard-fought overtime victories over Rosales. The rematch was inevitable at this weekend’s Thunderbird Invite. 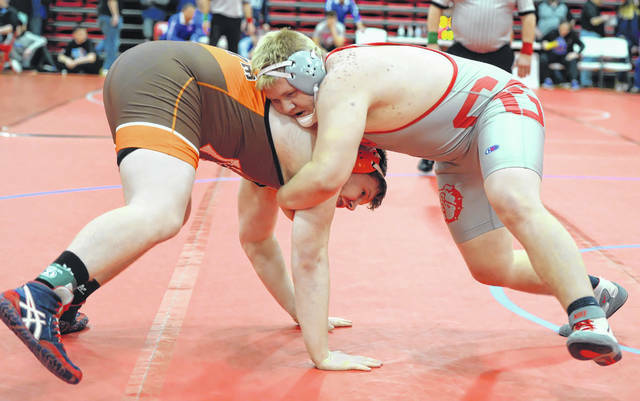 In Saturday’s finals of the 182-pound weight class, the two met for the third time. However, this time there was no overtime needed as Nassar took control after the first period and went on to record an 8-2 decision over Rosales. Last season, Nassar placed fourth in the 195-pound weight class at the state wrestling tournament in Division III. 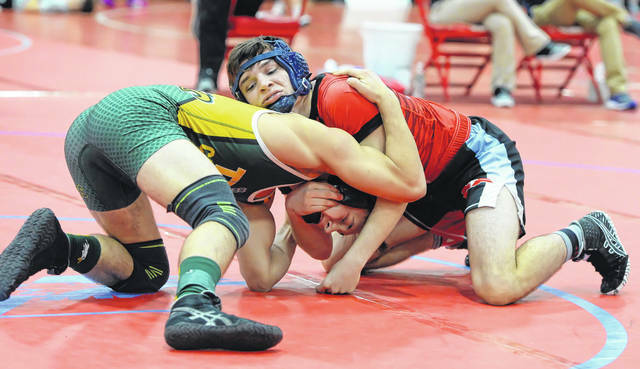 Rosales placed seventh at 170 in Division III at last year’s state tournament. After Saturday, Nassar improves to 27-0. Three of Rosales’ four losses this season have come from the hands of Nassar. Nassar came into Saturday’s championship match against Rosales with a little different approach than in the previous two meetings. “I found out in the last overtime (win) that I could do what I needed to do,” Nassar said. “I was hesitant with my shots before; and in overtime (previous match) I knew I had to do it, and I did. So, now I just treat the three periods as overtime. I just need to get my take downs in, so I don’t have to do overtime. “It was basically a battle of muscles the past couple times. Today, I used my technique a little bit more to get my take downs,” he said. Nassar feels like he has the upper hand with the O-G standout. “He knows I’m the one to beat. It’s basically me defending my pride. I think the pressure is on him a little bit,” Nassar said. Rosales noticed early in Saturday’s title match that Nassar was going to be more aggressive. “I got out of my comfort zone,” Rosales said. “But I was still sticking to the plan, shooting that low shot. I got under him a few times. He’s a good, strong kid. I just opened up a little more and took more shots, and he did the same thing as well. It was a good match. For Nassar, wrestling in the 182-pound weight class seems to be a good fit. “It’s a little bit up in the air, but I’m leaning toward 182 right now. I think I can do some damage at 182 at state,” Nassar said. With his dominant performance this weekend, Nassar was voted by the coaches as the most valuable wrestler of the tournament. Longtime Bluffton coach Jeff Kleman was pleased at how Nassar came out and wrestled Saturday against Rosales. In the final team scores Saturday, Troy Christian won the team title, defeating second-place Covington 193.5-179.5. Eastwood (155), Miami East (151.5) and Blanchester (129) rounded out the top five squads in the very competitive 43-team field. Allen East (108.5) had the best local performance, finishing seventh (108.5). Bluffton was eighth (92.5). Other champions Saturday included Ashland Crestview’s Dakota Blanton (132), Covington’s Kellan Anderson (106), Eastwood’s Brandon Hahn (120), Lakota’s Trevor Franks (160), Miami East’s Max Shore (113), Patrick Henry’s Wil Morrow (195), St. Joseph Central Catholic’s Noah Price (285), Swanton’s Ryan Marvin (152), Troy Christian’s Ethan Turner (126), Austin Awan (138) and Nick Baker (220) and Nick Burgard (145) and David Cumberledge (170) of Ashtabula St. John’s. This entry was tagged Bluffton. Bookmark the permalink.